Former lawyer turned professional coastal photographer based in the South of England, workshop-leader and public speaker. 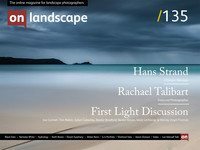 Winner of the Sunday Times Magazine’s award in Landscape Photographer of the Year 2016. There’s been a noticeable shift in Rachael Talibart’s images over time. Not surprisingly for someone with a self-confessed love of the sea, this has become an increasingly significant part of her work. There’s also been a move towards simpler compositions, with fewer references to location and it is these rather than her earlier landscape views that you will now find most prominent on her website and in her posts on social media. Can you tell readers a little about yourself – your education, early interests and career – and how you first became interested in photography? I’m a full-time photographer, specialising in coastal imagery. I live in Surrey now but I grew up on the South Coast, in a yachting family. For the first twelve years of my life, every weekend and all of the school holidays were spent at sea. Those years left me with a lifelong fascination for the ocean and, although I now live in a landlocked county, I go to the coast as often as I possibly can, at least once a week. I first became interested in photography in my teens when I was given a little cartridge-film camera for Christmas, one of those where the case folded down to make a handle. The obsession really set in when I took my first 35mm camera on a 9-week, solo, backpacking trip around the world. I’d just qualified as a solicitor in a ‘magic circle’ City firm and was able to take unpaid leave before settling into the rigours of practice. When I got back, I spent my first pay cheque as a qualified solicitor on an SLR and that was it - completely hooked. You made a radical change in career and presumably not one driven by financial reward. What prompted this? I left the legal profession in 2000, when my daughter was born. There were lots of reasons, but looking back I see that I had become bored. It wasn’t just that I wanted to spend more time with the kids; I needed a new challenge. So I went back to university, studying part-time while the children were little. I was still enjoying photography as a hobby but had no plans to make it a career; that just evolved naturally. I want to be clear that it has only been in the last year that my photography has started to pay enough that I need to bother the tax-man. It’s easy to make a few sales sound like a lot in conversation and, as it’s better for your profile to sound successful, photographers are not always upfront about this side of things. In reality, it’s not easy to make money in this game and much patience is needed. If you add up all the expenses (all those miles spent driving to the coast and back! ), any income soon gets swallowed up and, if you view it as an hourly rate, well, you’d be better off doing something else. I think most people who choose this life are in it for the love of it, not to get rich. In this respect, I’m lucky that I am a little older and have something to fall back on. I don't have to spend time doing commercial work to pay the bills, which gives me more time for doing what I love.